The HDMI standard is one of the best things to happen to home entertainment. It's such a successful method of delivering high-definition audio and video, most new home entertainment devices like Blu-ray players, games consoles, and media streamers come with HDMI ports built in. As your home becomes filled with HDMI devices, you'll notice that they begin to spread apart, requiring longer HDMI cables to connect them all up. This can be a problem for a number of reasons. To begin with, while HDMI is excellent for transferring crystal clear images and sound over short distances, the further the data has to travel – especially distances further than 10 metres – the more the signal deteriorates. Another problem is that HDMI cables can become very expensive when you want them to cover long distances. The Truelink HDMI over CAT5e addresses this problem in a novel way. It uses two network CAT5e cables to transmit the signal up to around 60 meters. Not only does this extend the range of HDMI devices by up to six times, but even two CAT5e cables will be cheaper than one long HDMI cable. 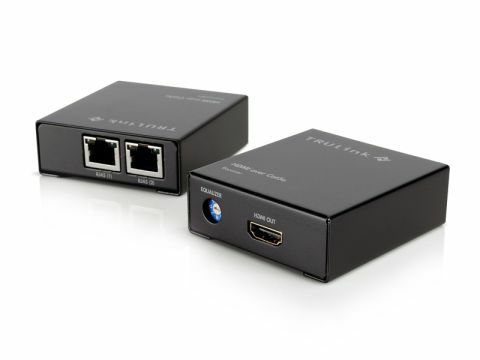 When using the Truelink HDMI over CAT5e extender the video bandwidth is 4.95Gbps, which although lower than HDMI 1.3 (which is capable of up to 10.2Gbps) is still able to transmit full 1080p video over 40 metres without too much loss of quality. Below 40 metres and the signal is carried perfectly, though between 40 to 60 metres, the 1080p quality breaks down and a lower resolution of 1080i or 720p is needed. It's not perfect and can't compete quality-wise with a HDMI 1.3 cable over a short distance, but the ability to transmit signals over a much greater distance is so useful that a slight drop in quality is forgivable. It's a great tool for transferring signals, but you can't use it with wall plug networks – the cables must be dedicated to the task.